Scotland is your home, you are welcome here, and you are valued. You play a crucial role in Scotland’s economy and public services. You are a vital part of Scotland not just for the skills and talent you bring to our country but also the diversity and richness you bring to our culture and communities. Recent statistics have shown that record numbers are visiting Scotland’s historic sights. However, a significant proportion of people working in the industry are EU citizens – over 11% – so leaving the EU is a huge threat to the strength of the sector’s workforce. Climate change is the most serious issue facing the world and is a truly global challenge. We have a moral responsibility to do what we can to prevent and mitigate the effects of climate change for future generations. This motion is a further attempt to propose a way forward. It provides the basis – even at this late hour – for a more sensible and less damaging approach. With now less than 1,000 hours until the date that Brexit is supposed to happen, the UK is dangerously close to the national economic crisis that crashing out of the EU without a deal would undoubtedly cause. Full video and text of Nicola Sturgeon’s speech at Georgetown University in Washington DC. Theresa May is running away from a vote on her disastrous deal, and kicking the can down the road will no longer work. Yet again, the Tories are putting party ahead of country, and we deserve better. This week, in Care Leavers’ Week, I’d like to pay tribute to all care experienced young people across Scotland. Friends, 25 years ago today I sat in another auditorium in this city, listening in awe to the great Nelson Mandela. Theresa May’s only plan for the UK’s future relationship with the EU, the so-called ‘Chequers Agreement’, is totally inadequate and completely unworkable. This week First Minister Nicola Sturgeon will set out the Scottish Government’s plans for the year ahead in her Programme for Government speech. Ahead of meeting the Prime Minister in Edinburgh today, the First Minister has demanded that Prime Minister Theresa May sets out her plan B on Brexit. Here’s what Nicola Sturgeon has said in full. The one week countdown to Scotland’s biggest sporting event since the 2014 Commonwealth Games is on and it’s a festival of sport happening right here in Glasgow. Last week the country came together to celebrate the 70th anniversary of the NHS – considered by the vast majority of us to be our most precious and cherished institution. Tomorrow, at a country house in Buckinghamshire, the latest episode of the farce that passes as policymaking in the Tory party will be played out. Today Westminster MPs will vote either to defend the Scottish Parliament or to fundamentally undermine it. Read SNP Leader and First Minister Nicola Sturgeon’s address to the SNP conference in Aberdeen. As delegates head to Aberdeen this Friday for SNP conference, there has been a palpable change in the air in Scottish political debate. It’s right that we have a debate on what an independent Scotland could look like and how independence can help us achieve our ambitions for the country. The task ahead for Scotland is to match those other small, successful nations, creating more jobs and raising living standards, providing a better future for everyone who lives here. 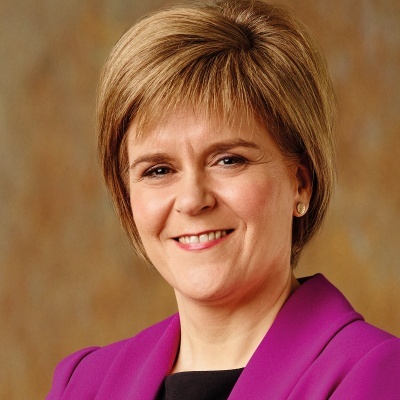 First Minister Nicola Sturgeon marks Mental Health Awareness Week. Scotland is a bold and positive country, rich in history and heritage, but forging ahead in a way that is progressive, pioneering and inclusive.